Lifehouse. It’s probably one of those names pushed aside by the contemporary. It’s true, it was the early 2000s when front-man Jason Wade pushed the group to radio salvation. If you don’t recall, their classic and arguably most successful track was “Hanging by a Moment” (which, by the way, is among the songs which represent that awkward transition from the colorful 90s to the “future” and the turn of the Twenty-First Century, don’t you think?). However, Almeria is new. No really. It’s not just stamped with “Made in 2012”; the content is evolved compared to what you might expect from an otherwise outdated Lifehouse. The album is primarily built along pop melodies and overall pop texture, but it is more than a complete rehash of a better Lifehouse past. In fact, it seems to be a step forward. With that said, the music is respectable. The soundscapes and production give it a contemporary indie-pop/synth-pop timbre while Lifehouse’s musical tradition, primarily the work of singer/songwriter Jason Wade, gives it that old familiar 2000s taste. Track 4, “Moveonday” is an interesting song. With elements of grunge, pop, blues, and some electronic texture, it’s a good representation of what would seem “2010s post-grunge” and a decent progression of pop-grunge since the early days. The next track, “Slow Motion” is a sing-along anthem which starts 2012, becomes 1996, and back again. It is actually a very cool concept, intended or not. Other tracks like “Where I Come From,” reminds the listener of yesteryear with corny, emotional pop-grunge ballads. Also, the final song “Rolling of the Stone” conjure images of what I would imagine a contemporary spaghetti western theme to sound like. More or less… Seriously, it’s a pretty epic and winding track. Final verdict: listenable. These days it’s hard to keep very large-scale pop record production and keep your own artistic interests in the picture as a musician. 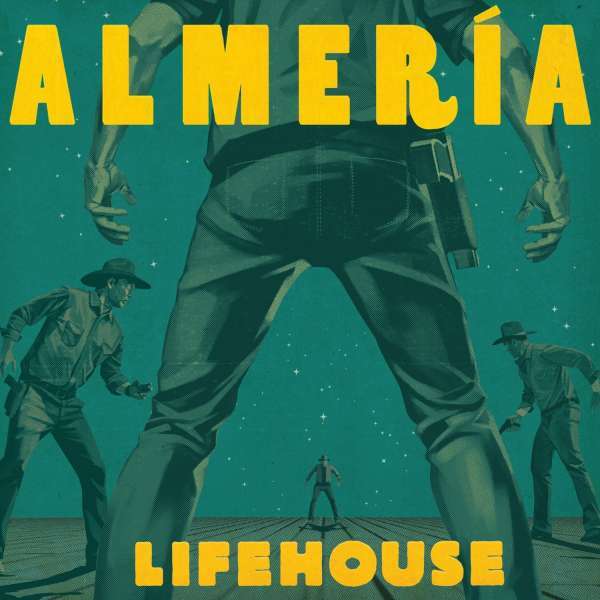 Almeria sounds as if Lifehouse was aloud some grace to grow. Though still very poppy, the album is not just a rehash of old successful formulae (unlike Green Day, no offense). In the end, Almeria deserves a critical listen. It may not yet deter listeners more than invite them.